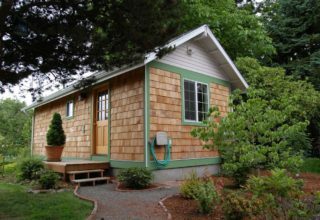 An accessory dwelling unit (ADU) is a small, self-contained dwelling that is allowed in conjunction with an existing single-family dwelling. An ADU has its own outside entrance and a separate kitchen, bathroom, and sleeping area. An ADU can be an apartment created within an existing home, an addition onto a home or above a garage, built as a freestanding cottage, or designed and constructed as part of a new housing development. 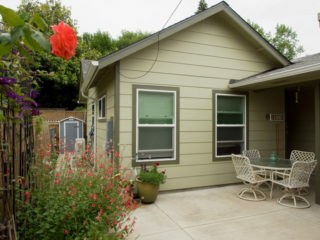 Temporarily waiving the City’s system development charges for ADUs from July 1, 2017 through June 30, 2019. Promoting awareness of possibilities for ADUs. Revising the Development Code to make it easier and potentially less expensive to build an ADU. Watch a video about ADUs in Springfield. From July 1, 2017 through June 30, 2019 the City of Springfield is waiving transportation, stormwater, and local wastewater system development charges (SDCs) for newly permitted ADUs. This waiver reduces the cost of construction of a typical ADU by an estimated $5,000 to $6,000. The Metropolitan Wastewater Management Commission has budgeted funds to offset the SDCs for ADUs that are newly constructed homes. In August 2018, Springfield Utility Board reduced its SDCs for ADUs (read more here). Note that SDCs imposed by Willamalane Park and Recreation District are still in effect. Code requirements are summarized in this brochure and can be found in Section 5.5 of the Springfield Development Code. On March 5, 2018, the City Council adopted Ordinance 6376 to amend the Development Code to make it easier to build ADUs within the City. The amendments went into effect on April 4, 2018. On June 25, 2018, the City Council adopted Ordinance 6384 to allow ADUs in the urbanizable fringe (the area within the urban growth boundary that is outside the City limits). There were also some minor amendments affecting the setback from an alley when converting a garage to an ADU, requiring that unpaved off-street parking spaces be rocked and maintained, and always requiring a foundation for manufactured homes and towable structures. In most cases, use this application form (Type I) to apply for an accessory dwelling unit. If your property is in the Washburne Historic District, if you are providing a parking utilization study, or if you are meeting alternative design standards, please use this application form (Type II). The total land use application fee for a Type I ADU is $851.55. The total land use application fee for a Type II ADU is $1025.55. To expedite the approval process, you may apply for a Building Permit Application and Land Drainage and Alteration Permit (if required) at the same time as you apply for the land use approval. The City Council wants Springfield to be a family-friendly community for all people in every phase of life; whether it’s just starting out with a new family, or downsizing to a smaller home. There is a lack of available housing for all income levels in Springfield, and existing housing is expensive. Learn more about the City’s affordable housing strategy here. Increasing the number and type of affordable housing units without consuming land in the city’s limited inventory of undeveloped land. In particular, they increase the supply of small rental units which is where the rental market is currently the tightest. Increasing density in existing neighborhoods, taking advantage of existing infrastructure. Creating opportunities for intergenerational living, on-site caretakers/assistants. Diversifying the demographics of an existing neighborhood. Providing financial benefit to the property owner. Triggering economic development at a local scale through local builders/contractors.